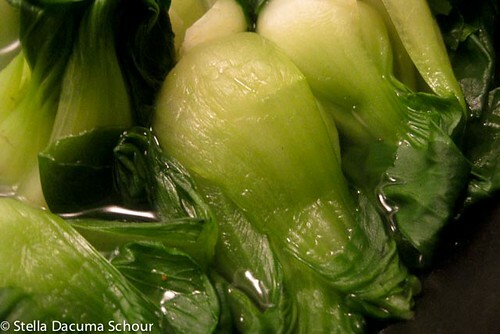 Aaahh… bok choy! Whenever I dine out with my friends at any Asian restaurant, there is a prerequisite of ordering vegetables. This is because we believe in ordering “the basic food groups” which means, a chicken dish, a beef dish, a pork dish, a seafood dish and a vegetable dish. I know that’s a lot – but we manage to gather at least four people during dinner just to be able to order this way. 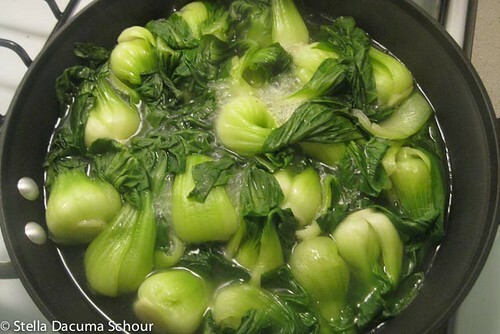 This dish is not Filipino in origin, as bok choy is a Chinese vegetable, however I’m sure any rice-loving Filipino would love to eat this with rice and meat! In reality, vegetables cost next to nothing at the Asian store, that I rarely pay attention on how much it actually is. A bag of vegetables costs anywhere from 69 cents/lb to $1.99/lb and usually I don’t spend more than $5.oo for the vegetables. You may eat this as is, but I like to eat this with rice and a small piece of meat/fish. 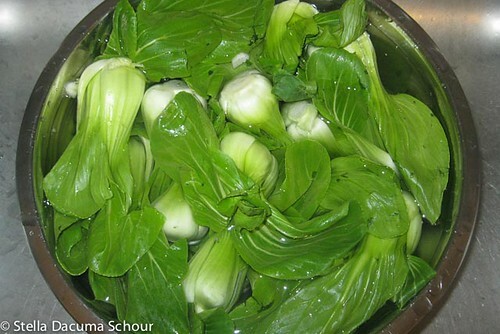 Bok Choy – one bag. According to my receipt, I used 1.22 lbs of Bok Choy in this recipe and it cost me 79cents/lb and I paid 96 cents total! 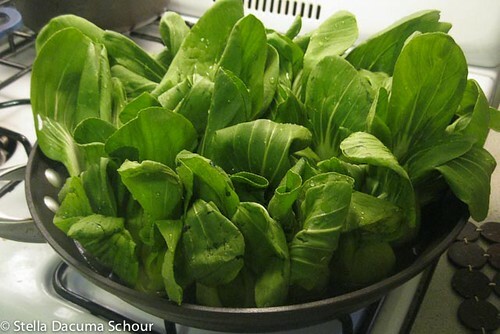 If bok choy is not available, any leafy vegetable of your choice will do. Oyster Sauce (to taste) Lee Kum Kee is my favorite brand! Chili Sauce (to taste) This one says “Spicy Chili Crisp” to be honest, I was hoping that it was the same thing you’d find on the condiment table in a Chinese restaurant. It’s pretty close, and this brand is good! 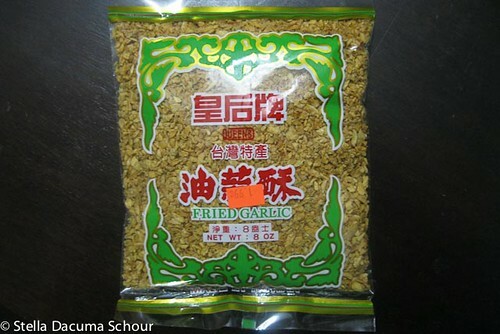 Fried Garlic (to taste) – Find it at the Asian store, or make some for yourself – you will find the process in my Arroz Caldo post. It’s $1.99 worth of happiness to me. Garlic rice in an INSTANT! 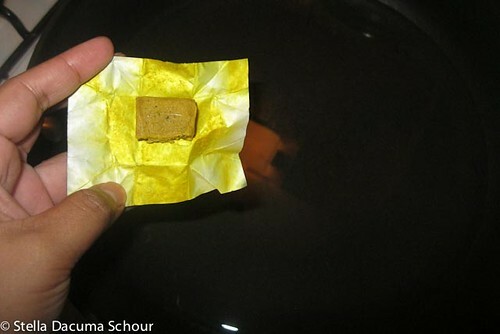 *Notes on multiplying the dish – if making double just use an entire chicken bouillon cube, and add more water. 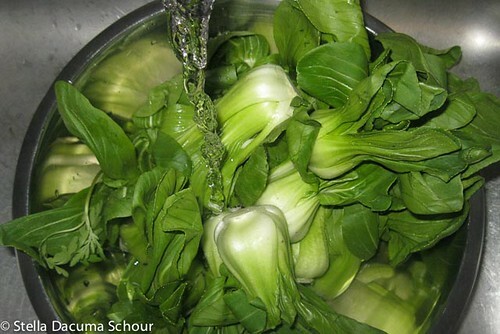 Wash the bok choy thoroughly by soaking it in cold water for about an hour in a big bowl, and changing the water every half hour. All the grit will fall to the bottom of the bowl. Rinse. Repeat if necessary then drain. Don’t bother drying. Fill a shallow a pan/pot with a cover with an inch of water. 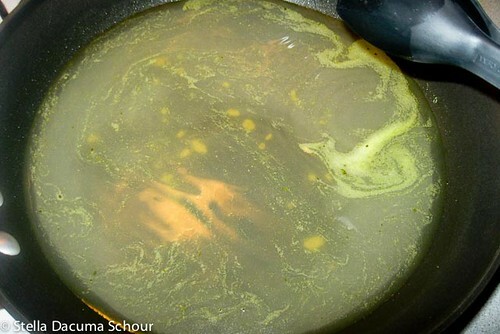 Dissolve half a chicken bouillon and let it boil. If using soup stock, just let it boil. A frying pan + Stainless bowl will do just fine! It’s what I use! 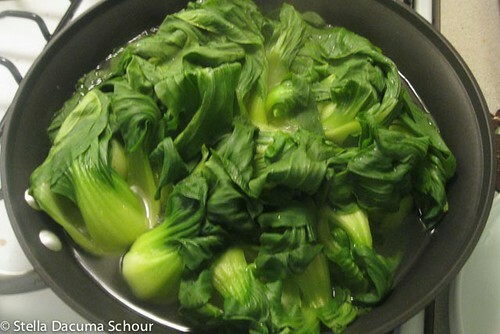 Once it starts to boil, let the bok choy stand up on the pan. 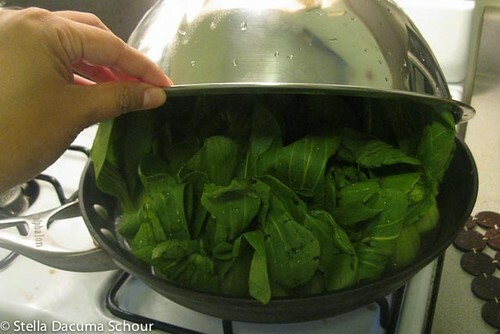 The bottom part takes longer to cook than the leaves, and it really looks cute in the pan this way. Cover and let it simmer for 3-5 minutes. When the three minutes are up, it should look like this. The leaves will be much more wilted, and the stems are less green. When the stems are a little wrinkly you are done! Congratulations! Turn off the stove and drain. I personally just take it out one by one with tongs so I can plate nicely, and not wash a sieve. But that’s up to you. 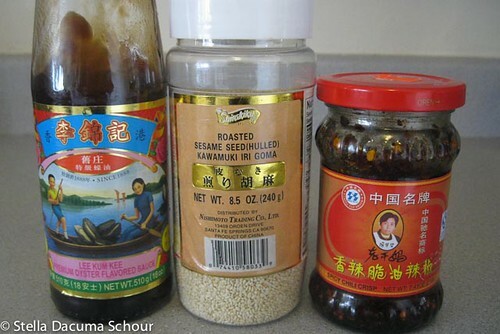 Option 1: Add oyster sauce and roasted sesame seeds. Oyster sauce has a strong flavor, so don’t put too much. Using the right amount is key. To be safe, separate it from the bok choy and let the diners season it for themselves! Option 2: Add chili sauce and fried garlic on top! The truth of the matter is, you can add whatever condiment you want! The Vietnamese restaurant I get take out from gives little tubs of Hoisin sauce and chili sauce. If you save these and keep it in your fridge, you can use that as well. The substitution of condiment is up to you, and if you have other suggestions for this dish, let me know! 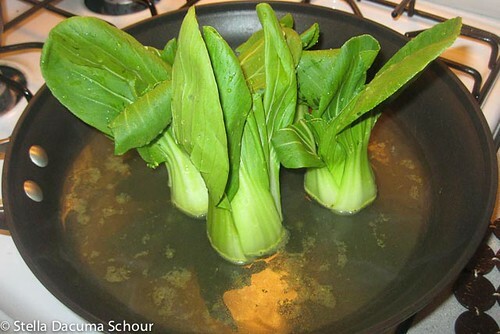 I adore bok Choy! Like this recipe a lot. Looks beautiful too! Side note: with the high population of asians in my neighborhood, you would think that there would be more asian markets! THANKS!!!! There should be one close to you, you just haven’t located where it is! 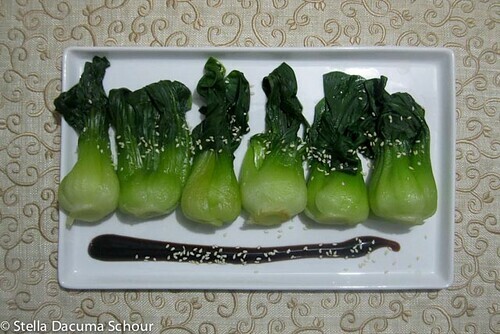 I love bok choy and this is such a simple, good recipe for preparing it. Will be great for Lent-Holy Week! Thanks for sharing! 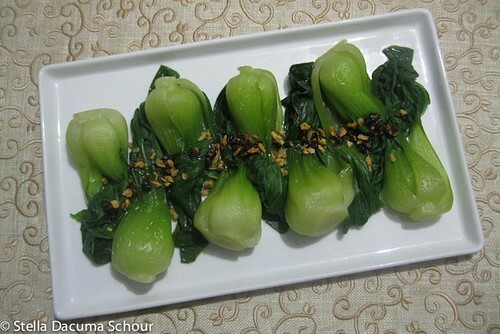 We love Bok Choy! Asian inspired cooking is so good and meeting all of you have made me enjoy it even more! Living in NYC there are so many great spots for it. I’m glad! Soon you will be wanting white rice with every meal, like I do. 🙂 Thanks for stopping by!